Friday April 1st 1921 Cora baked cakes to take to Aid meeting. Soon after dinner Rob took us all to town. I went to see about a pump for the kitchen. Then got some fruit to take to The Clark family. Stopped at Minnie Showers. When I went to the door to make the other call I found Mr Clark had just died. I called at Jennie Shucks. Spent evening at home. Saturday April 2nd 1921 Was about home in forenoon. Rob took us to ride after dinner. I stopped at The Cemetery and later went out to Ida Anderson on car. Did not find her at home. Came down see Ott. I rode home with him and after supper rode out near Morse with The Byingtons. Sunday April 3rd 1921 The folks went to Muscatine in the afternoon. I wrote to Lorie and Ida after looking over checks and sorting them out. Hattie went to church. we rode awhile. Bro Robs birthday. Monday April 4th 1921 I went to town for hair treatment. Rob brought me home. The girls did a big washing and both ironed some. I swept my part of the house and put things in order. A letter from Mrs Falk. 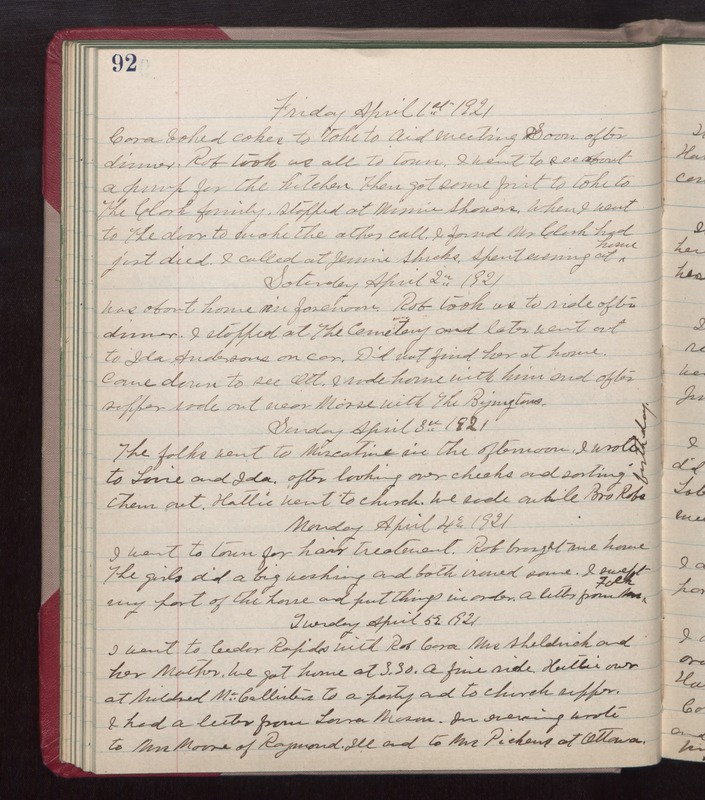 Tuesday April 5th 1921 I went to Cedar Rapids with Rob, Cora, Mrs Sheldrick and her Mother. We got home at 3.30. A fine ride. Hattie over at Mildred McCallisters to a party and to church supper. I had a letter from Laura Mason. In evening wrote to Mrs Moore of Raymond, Ill and to Mrs Pickens at Ottawa.